Marie Laveau, the legendary Voodoo Queen of New Orleans. Although Voodoo was practiced in America long before her birth, she is considered by many as the founder of American Voodoo. Triumphant in death as in life, her legend as Voodoo Queen and reputation continues to grow. Today Marie Laveau is honored as the spiritual patroness of American Voodoo and its folk magic cousin Hoodoo and called upon to aid Voodoo practitioners. American Voodoo came into prominence largely as the result of the efforts of Marie Laveau. Known as the Queen of all Voodoo, she ruled the world of New Orleans Voodoo for the greater part of the 19th century. Marie Laveau gained renown far and wide for her fabulous supernatural power and commanded the respect and admiration of people near and far as the Voodoo Queen of New Orleans, the most famous and powerful occultist in the world. She was both loved and feared by those who knew her, and even today the name of Marie Laveau remains synonymous with all that is Voodoo. Marie Laveau was also a devout Catholic but saw no conflict with this and her role as Voodoo Queen, for Voodoo has always been a tolerant and welcoming religion, open to the truths of other faiths and quick to adopt the veneration of new spirits. While other Voodoo practitioners mixed Southern folklore, also called hoodoo, and European sorcery into their practices, Marie Laveau encouraged worship of the Virgin Mary and other Catholic saints. In an era when life was short and hard, Marie Laveau promoted Voodoo as a practical religion that often seemed to work miracles, actually accomplishing things that other religions could only promise. Marie Laveau made Voodoo fashionable and popular among New Orleanians of every color. Marie Laveau's own ancestry was a diverse mix of black, white and American Indian. Her spiritual vision of Voodoo was a universal one and not limited to any particular cultural aspect. 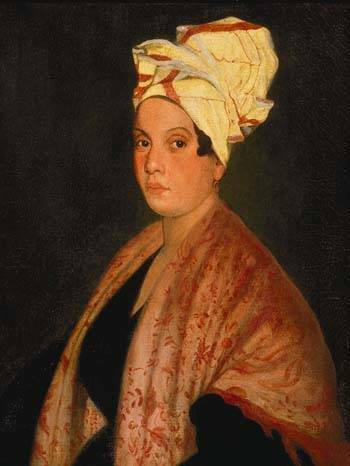 To this end, Marie Laveau created a unique form of Voodoo, combining African and Caribbean practices with European magic, Southern folklore and Catholic saint worship. A video on the life of Marie Laveau may be viewed by going to our Voodoo Videos page. The Voodoo Society is the last of the old-time occult orders and teaches Voodoo, hoodoo, traditional witchcraft, rootwork, conjure, pow-wow, folk magic and sorcery in the Old New Orleans Tradition of Marie Laveau and Doctor John.